Welcome to my porch. It's starting to warm up a bit this morning. There's a cat on the porch and a lamb grazing in the front yard. I have errands to run today and a trip to the city this evening so D1 can meet a longtime online school friend. I have a NuNaturals Stevia giveaway here on the blog. 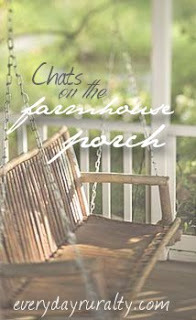 One of the ways of entering is to link up your chat. I know there are a number of you who do that anyway each week, but one little comment telling me to enter you, puts you in the drawing. The prize is one bottle of NuNaturals Orange Liquid Stevia and one bottle of NuNaturals Lemon Stevia. I am currently using the samples they sent and I can say that you will not be disappointed if you are one of the winners. I like stevia and have been using it for over five years. NuNaturals makes a wonderful product. You can enter here. Do you have any musical instruments in your house? If so, which ones do you have? When you take a walk, what are you likely to pick or pick up from the ground? They say to have breakfast like a king, lunch like a prince and dinner like a pauper. I guess that means you have fuel for your body to get through the day and don't have a full tummy when you go to bed. Are your meals like that? Do you prefer iced coffee or iced tea? How do you handle doing things you'd rather not do? We have a piano, a harp, two saxophones, a child size guitar, and a few melody harps (the small children's harp with cheat music to place on it for the right strings. The first two things are the ones that get used consistently. I'm likely to pick up coins or an unusual rock or pebble. We have a huge breakfast, a big dinner in the middle of the day, and something small at night. It's the farm way to eat- just ask the king! :) I grew up in the city, so a bagel was breakfast, a sandwich was lunch, and I had a big meal for dinner. I really think our current way of eating is probably healthier. I like both, but I'm a BIG fan of iced tea. I currently have three carafes of Vanilla Rooibos Iced Tea. I have to make lots of iced tea for our midday meal when we have not only family, but employees. They drain my iced tea each meal. Sometimes they just get water, but there's almost always iced tea in the fridge for me. Shh! I procrastinate if I can. I grumble if I can't (sometimes) and am always happy to get whatever it is done. I often wonder why I put the thing off to start with. Things sometimes seem worse in our heads than they do in reality. Great Questions this week Patrice. Also for helping me to see that it is Tuesday. Extra credit question: Oh yes, I think she could she is great at pet portraits. My MIL does that and you can't even believe how much dough she rakes in and she isn't 1/4th as talented as your daughter. Your daughter is awesome!!! We have a piano, guitar, harmonica, and a clarinet. I don't pick up things. I love iced tea, sweet, and especially brewed in the sun. Would love to win the Stevia...love that stuff ever since you introduced me to it!!! Also, I think your daughter has been blessed with such a great talent to paint....and yes, I think she should try the custom portraits. I know I already commented on the portraits and even said I would love one of my new girl Dollie, so YES YES YES she could do it!!! Love the questions this week. I love your answer to #5. Yes, sometimes things we don't want to do loom bigger chores than they really are. Your daughter is very talented and I think she could sell the custom portraits. I wish I could eat like that. My problem is that I don't have time in the morning to cook breakfast before going to work. I'm glad you put in a reminder about the giveaway! I'll do that next. There was a harpist at the wedding Sunday and I thought of you and harpist daughter- whom I'm sure is better than the one at the wedding. Anyway, I don't think there's one thing your daughters can't do so, Yes! sell those portraits! I didn't see the bonus questions until I was linking up. I definitely thing she could sell her work. It is amazing. I would love to see what she could do with my two daughters! Funny how most things we put off don't seem so ugly when they're all done. The relief at having it crossed off the list is always enormous. maybe that's why we do it - for that good feeling? Yes, I think the portraits would be very saleable. She's good. I'm a fairly new fan of your blog and am wondering how you came to start the Chats on the Porch. How do you determine the questions to use?